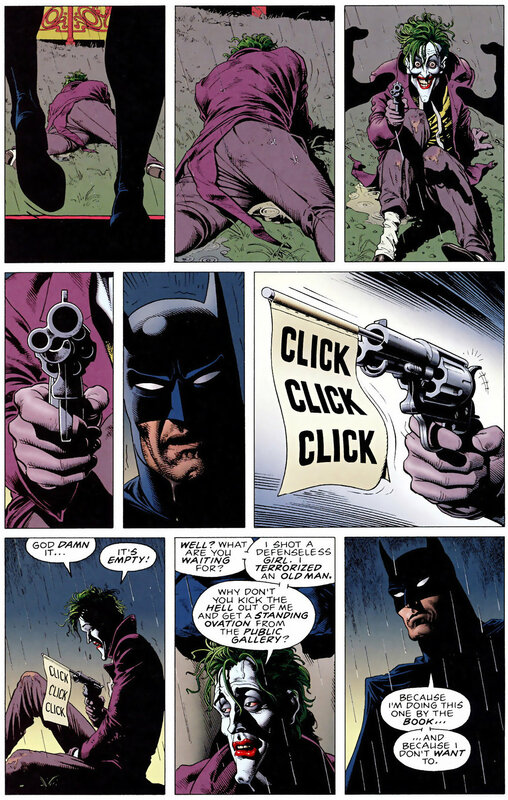 “The Killing Joke” (1988) is a quite popular graphic novel written by Alan Moore and drawn by Brian Bolland. It focuses on what goes on in Joker’s mind and more specifically on his origin (although it's still not a certain one since Joker later states that he remembers his past in different ways: “something like that happened to me, you know. I... I'm not exactly sure what it was. Sometimes I remember it one way, sometimes another... if I'm going to have a past, I prefer it to be multiple choice!“). The story depicts Joker’s plan, which he architects to prove his theory: all it takes to drive a normal person insane is one bad day. In order to prove it, Joker decides to use Jim Gordon as his ‘cavy’ and therefore to drive him insane by torturing the person he loves the most, meaning his daughter, Barbara Gordon. his name was Jack Napier and he once worked at the Ace Chemicals as an engineer, but, since he wanted to become a comedian, he quit and became a failed, jobless entertainer. He was married to Jeannie, who was seven months pregnant with their first child, thus he needed a new job capable of maintaining him and his family. He found the chance to become rich in the infamous Red Hood criminal gang, that threatened him to still be loyal to the plan after his wife sadly died in a household accident. In one day he lost his wife, his child, his face and he got betrayed by the criminals he worked with. After this chain of events Jack was no more and Joker was born. This comic is quite dark and gritty, revealing and at the same time mysterious. The Joker is not a mere psycho who purely acts on his needs and instinct; on the contrary he is smart, he knows the difference between good and evil, but he just doesn't care. He is a criminal because he sees his dynamic with Batman challenging, but at the same time he just really enjoys the role of creating chaos. So yes, he is a monster with no moral compass, but sometimes also a monster who tries to communicate something. This detail is perfectly represented in The Killing Joke: why does he feel such need to prove his theory? Is he some theoretical philosopher who wants to show everyone what his doctrine is about? Perhaps yes, that's the answer. He wants to show what his theory is about. But why? Everybody knows that Batman is possibly the only person Joker “cares” about (a dynamic relationship which is often over romanticized into romantic feelings). Why's that? Batman has had his bad day too, but instead of turning him into a villain, it made him become a hero. It fascinates Joker and it makes him think the two of them are opposites and yet still alike! At the same time, Joker is convinced that Batman was saved after his tragedy (if you think about it, after his parents’ death, Bruce had Alfred, a few friends, money, while Jack had nothing --besides a new clown face-- and no one after his wife died). “You had a bad day once, am I right? I know I am. I can tell. You had a bad day and everything changed. Why else would you dress up like a flying rat? You had a bad day, and it drove you as crazy as everybody else... only you won't admit it! You have to keep pretending that life makes sense, that there's some point to all this struggling! God, you make me want to puke. The bad day they have in common isn't the only thing that pushes Joker to leave a free ticket to involve Batman in the plan: the vigilante was there in the final moment that drove the poor Jack mad. Joker considers him in part responsible and that's why he made it his cause to challenge the dark knight until the same thing happens to him. Perhaps the clown prince might’ve actually wanted to explain to his nemesis, and at the same time best friend, what happened to him. It's likely that Joker was focused on driving Batman insane more than Gordon: Batman, sooner or later, has to reach his breaking point and finally break his number one rule to never kill. Of course, Joker’s plan fails as both the commissioner Jim Gordon and the dark knight don’t lose their minds. Batman, although probably very tempted, doesn’t try to kill him, instead he offers his help. Joker turns down the offer, declaring that it was too late for him to be redeemed. The whole dynamic is challenging to the mad man, indeed it's likely that Batman’s offer incited the Joker even more. The comic ends with a joke, which was probably a metaphor about the two of them. The story is about a madman who offers the other one his help to escape, but not a very genuine one, indeed if the other madman accepted, he'd probably be dead! Perhaps it's just a random joke placed there to end in theme, or perhaps one of the two madman is Batman and the other is Joker. That's how I see “The Killing Joke”. Not only is the art perfect and the plot well developed, but the characters are also perfectly written in their details and the sparkle of mysteriousness makes the whole novel even more interesting.